First off, there were no new court filings today and relatively little occurred during the actual trial. The Franken campaign called a number of voters to the stand and Mr. Mansky, the Ramsey County Elections Director, returned to testify about election judge training. Secondly, and most importantly, I discovered an academic paper written in the year 1973 by a Harvard professor and a Columbia University professor; I came across the document while searching for the court case Santucci v. Power [25 N.Y.2d 897, 252 N.E.2d 128, 304 N.Y.S.2d 593 (1969).]. Prof. Micheal O. Finkelstein and Prof. Herbert E. Robbins coauthored this paper entitled Mathematical Probability in Election Challenges; in spite of its age, the paper is surprisingly relevant to the Minnesota Election Contest at hand. Defeated candidates in primary elections sometimes challenge the results in court and collect evidence of irregularities in support of their claims that the contests should be rerun. Frequently, this evidence consists solely of proof that certain numbers of persons voted who were not qualified, with no evidence of fraud and no indication as to how such persons voted. How large must this group be before a new election should be ordered? A.	Franken's Amended List: Within Franken's list of wrongfully rejected absentee ballots he presents 1,585 voters by name, but 781 are also found within Coleman's list. This leaves 804 new and unique voters presented by Franken. B. More Extrapolations and Interventions: The Coleman campaign listed 4,458 voters by name, on their website, whom they believe had their absentee ballots improperly rejected. This number is realistically far less based upon the court's constriction of eligible absentee ballots. C. Coleman Futile Election Contest: The 1,391 represents the number of votes above and beyond the number of voters recorded on Election Day within each precinct in Minnesota. The New York Election Law provides that a new primary election may be ordered when the "irregularities .. . render impossible a determination as to who rightfully was ... elected." Consider a two-candidate contest in which the winner prevails by one hundred votes out of ten thousand. If there are 150 irregular voters, it is possible that more than 125 of them voted for the winner, so that their elimination would reverse the election. Does this possibility mean that the rightful winner cannot be determined within the meaning of the statute? The courts have answered this question with intuitive assessments of the probability that the result would be reversed if the challenged votes were removed. Thus, the Court of Appeals has articulated and applied the principle that the party attempting to impeach the results must show that the "irregularities are sufficiently large in number to establish the probability that the result would be changed by a shift in, or invalidation of, the questioned votes? Two polar assessments of the relevant probabilities may be illustrated by comparing Ippolito v. Power: with De Martini v. Power" In Ippolito, the winner's plurality was 17 votes out of 2,827; there were 101 suspect or invalid votes. The court affirmed the lower court's ordering of a new election. Evidently relying on intuition, the court concluded that " it does not strain the probabilities to assume a likelihood that the questioned votes produced or could produce a change in the result." In De Martini, out of 5,250 votes, 136 were declared irregular and invalidated, no fraud being involved. The winner's plurality was 62 votes . The lower courts and Court of Appeals differed in their estimates of the relevant probability. The Supreme Court ordered a new election because "it is not beyond likelihood that the small difference of 62 votes could be altered in a new election?" The Appellate Division unanimously affirmed. In reversing, the Court of Appeals observed that the majority of the winner would not evaporate unless at least 99 votes-i.e., at least 72.8% of the irregularities-had been cast in her favor. The court found this unlikely: " It taxes credulity to assume that, in so close a contest, such an extreme percentage of invalid votes would be cast in one direction ." It concluded that "a valid determination is not rendered impossible ... by the remote possibility of a changed result . . . ."
Subjective estimates of the relevant probabilities have thus varied . There is, however, no reason to leave matters on a purely subjective basis. 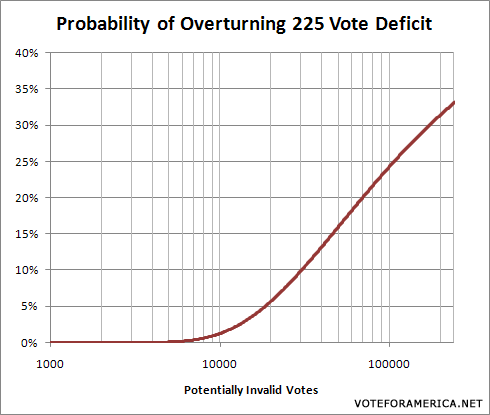 Using an assumption about the character of invalid voting which will be defensible in many cases, the relevant probabilities can be readily computed. Let's assume for a moment, actually the rest of this article, that Minnesota has a provision similar to that of New York which provides for a new election in the event of prominent voting irregularities. The Coleman campaign referenced the ruling established in Santucci v. Power yesterday in which "there were 101 suspect or invalid votes," and this quantity, with respect to other factors, contributed to the Court's decision to affirm the order for a new election. The definition of "suspect" and "invalid" remains somewhat unclear in this context, so let's just assume that the sum of all votes, either properly cast and not counted or improperly cast and counted, constitute the aforementioned definition of "suspect or invalid votes." Please note that this is likely not a valid legal definition, but this assumption will eventually allow me to make a mathematical point. The variable d represents the margin by which the current leader, currently leads; s is the number of votes cast for the second place candidate and k is the number of invalid or suspect votes. A complete derivation of the above formula is available in the appendix of the paper. The output of this function produces the probability of overturning the election result given the inputs, d, s and k. Another formula is also presented in the appendix that allows for separate computations on the precinct level; I may get ambitious and produce additional calculations for the 1,391 potentially double counted ballots at a later date. For the purposes of this article, the formula above will be used. You'll notice that Coleman has less than a 1% change of overturning the election outcome if the already generous allotment of the 6,653 invalid votes are actually deemed to be invalid/illegal/suspect/etc. While this number seems exorbitantly low, the New York case of Lowenstein v. Larkin [40 App. Div. 2d 604, 335 N.Y.S.2d 799 (2d Dep't 1972)] in 1972 contained a probability of overturning that was basically zero (8E-85). The court however, still ordered a new election, although its widely accepted that the judges within this case possessed no intuitive probability skills and as such, they totally blew the ruling. If Minnesota Statute provided for a new election in the face of voting irregularities, Coleman would have less than a 1% chance of overturning the current result. If Coleman could somehow double the number of invalid votes, his overturning percentage would only reach 5% which is still too low for an informed court capable of ordering a new election, to actually order a new election. Using the principles from the 1973 paper, I think its fair to conclude that Coleman needs a massive anomaly, of one form or another, to emerge from this election contest with the lead, which is improbable but not impossible. Update [5:08 PM CT 3/6/2009]: I used a mathematically incorrect equation to determine the probability of overturning. The resulting correction did not materially affect the conclusion of the article; the probability dropped from about .9% to about .3%. One could however argue, as a commenter did below, that the conclusion is not particularly beneficial because the applied principles do not reflect the actual situation given the varying demographics of an entire state. I've since written a follow-up in which I re-calculated the overturning probability using county and precinct level data from various lists provided through the litigation process. This takes into account statistical probability, but Coleman is probably banking on the fact that many Democratic voters have lower income, and are less likely to be able to take off work to vote. Therefore, if the dispute is all in absentee ballots, what is the probability that all regular voters and all absentee ballot voters will all vote again in the next election (mind you, a non-presidential election)? The other assumption Coleman and the Republicans are making is that Franken wouldn't be able to get out many of the Obama voters. Obama won in MN by a wide margin, but Franken/Coleman was very tight. In addition, whether or not Coleman would win a re-vote is almost irrelevant. (1) They can't possibly win without a new election (although there's no law in MN to allow that). (2) They want to delay that 59th Senate seat for the Democrats as long as possible, at any cost. (3) They hate Al Franken, since he has said bad things about Lord Rush in the past. This is a pretty silly exercise in bogus statistics. Treating the questioned votes as independent random variables with probabilities inferred from the tabulated votes involves numerous important false assumptions. The errors that lead to votes being undercounted (or in rare cases overcounted) were very blotchy and uneven between districts. That radically increases the uncertainty of the sum. Your Gaussian-based calculation is essentially irrelevant to that uncertainty. Of course, Coleman has produced no evidence that the systematic error went against him. Usually, systematic error favors the Republican. That's why the recount, which repaired some undercounts, favored Franken by much more than would be reasonable to expect from the sort of statistics you use. So, much as I hope (and have paid for) Franken to win, I think the proper arguments of the court should rely on more realistic subjective probabilities, hopefully done with sophistication, and not on your precise but irrelevant calculation. this is all too confusing!